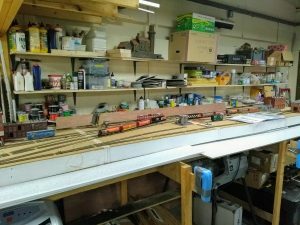 View of the layout under construction. Posing for the photo are a Dash8-C40W, and a GP40-2W. 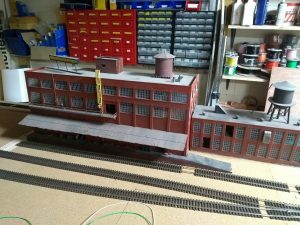 Hamtramck (pronounced Ham-tram-ick) is an HO scale USA-set layout being built by Thistle ModelMakers Society. It is set in the town of Hamtramck Michigan, which is bordered pretty much entirely by the city of Detroit, famous as the “Motor City”. Despite Detroit’s industrial decline, there are still several auto manufacturers present (including GM who have an assembly plant in Hamtramck itself). The scenario here is that a nearby industrial site has recently been developed with money from Hamtramck and Detroit’s local govts to create jobs. Thanks to President Trump’s ongoing trade war against the EU , Mercedes Benz have opened up shop in Hamtramck. The Packaging Plant (already part built). 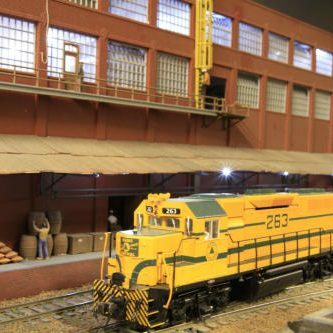 This model was rescued from our now retired Phoenix Fruit Express Layout. Some windows need to be added back in!